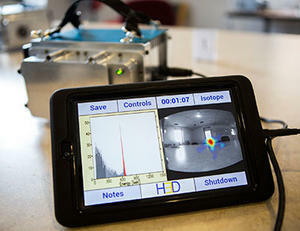 A handheld radiation camera developed by University of Michigan engineering researchers offers nuclear plant operators a faster way to find potentially dangerous hot spots and leaky fuel rods. The new Polaris-H detector lays a gamma-ray map over an image of a room, pinpointing radiation sources with unprecedented precision. At least four U.S. nuclear power plants are using versions of the camera, which is now available commercially through the U-M spinoff company H3D. The new Polaris-H detector lays a gamma-ray map over an image of a room, pinpointing radiation sources with unprecedented precision. At least four U.S. nuclear power plants are using versions of the camera, which is now available commercially through the U-M spinoff company H3D. A U-M release reports that a radiation imager offers plant managers like Hite a quicker way to identify and locate problems, including radioactive buildup in pipes, stray radioactive particles in otherwise clean areas and leaky fuel rods. Also, in the event of an accident, an imager could monitor radiation plumes and point out contaminated areas. The gamma camera operates at room temperature, which is an improvement for the many plants that currently work with cumbersome, cryogenically cooled detectors. Room-temperature radiation imagers have been poor performers in the past, so many nuclear power plants in the United States rely on non-imaging detectors to find contamination. Locating the source of the problem often means moving the non-imaging detector around the contaminated area to find areas with high radiation counts. The technology grew out of a project in He’s lab. The original briefcase-sized Polaris was developed for catching terrorists, but the team quickly realized that the nuclear energy industry could put the technology to use for safety. Five of He’s former graduate students making up the bulk of the company’s staff. The release notes that prototype models are in use at the Cook plant and South Korea’s Institute for Basic Science in Daejeon. Based on feedback from these users over the past year, the team made it possible to operate the camera using a simple red button to start and end measurements. Kaye said that this level of information has not been available in the past, so the H3D team hopes to educate customers about how it can be used. For instance, sometimes the radiation source is ambiguous after detector measurements. A set of pipes might appear to be radioactive, but an image could clearly show whether the radiation was uniform, or whether some pipes were more radioactive than others.